Sonic Drive-In is a unique dining experience that used to be everywhere in the 1950s and 1960s but has since receded into the depths of time – the drive-in. Sure there are still drive-ins around, but finding a good one is harder than it sounds. Sonic is easily at the top of that list. 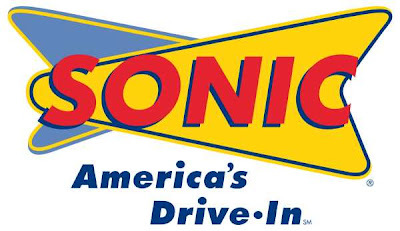 Sonic has taken the drive-in experience to the heights of ‘fast’ food the same way McDonald’s pioneered the drive-thru concept. You pull up to a parking spot with an entire drive-thru menu next to your car, then you stay and eat. Place your order (when you want, there’s no rush here) and a carhop (for lack of a better word, but it is the correct term) will bring your food out to you. And it happens fast, really fast, and on an equally impressive level, your order is accurate. As someone who normally has special requests on his order, I can tell you this is an admirable talent. Special orders really don’t upset them. Some fast food places will say that, but Sonic means it. All A-plusses for service. The food is much better than I thought it would be. As a Jersey resident, I had heard fabled stories of Sonic, which up until very recently none existed anywhere near me. Opportunity knocked with the discovery of one nearby Philadelphia Park on Street Road in Bensalem. The burgers are very good, the desserts amazing and the drink selection (they claim 168,000 possible flavor combinations, woo-hoo!) is unparalleled – but what I’m sure you really want to hear about is the favorite fried food. 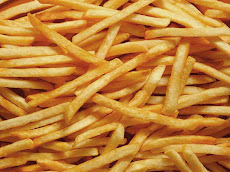 The sad news is that Sonic fries are unimpressive. They come in shoestring variety, just a bit larger than McDonald’s and Burger King, thankfully not very greasy, but unfortunately not very hot either. Not awful, mind you, but neither are they spectacular. They are great for putting on your burger, and I wouldn’t turn them down, but I wouldn’t go out of my way for Sonic fries either. Sonic also has Tator Tots (spelling in context from the receipt). While an interesting and unique choice as many fast food and franchise restaurants don’t carry them, Sonic’s tater tots (my spelling, and I’m sure the correct one) are only adequate, even with cheese added. Honestly, frozen tater tots from your grocery are better than these baked in your own oven. Not of interest to me of course, being a purist, but both the Fries and the Tots can come in a cheese or chili cheese variety. Beat that, McD’s and BK. 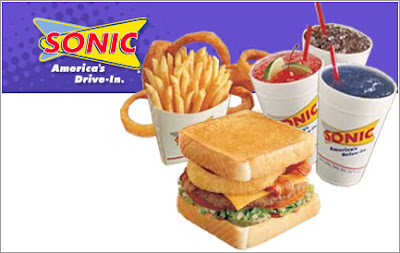 But we can’t shut Sonic out completely in the side dish category as they also have more than a few other selections. Among them apple slices and bananas (to make the Health Nazis happy), mozzarella sticks, corn dogs, popcorn chicken, and even French toast sticks as their breakfast is available 24-7. Topping the list of alternative sides are the Sonic onion rings. Similar to Fatburger’s o-rings (and that’s good thing), these are hot and very tasty. Unlike Sonic’s fries, I would go out of my way for their onion rings. Yep, they’re that good.